My Kole tang has several bumps UNDER the skin on both sides of body. My Heniochus picked at them and now they're light pink from skin shedding. I Google and couldn't find a good identifier. I just bought him last week, could this be from capture and handling? Just concerned it will get worse and unsure if it's HLLE. Any ideas? He swims all over and eats well. Reef Octopus 150 skimmer, Corallife 150 watt 20 k - radiums, 2x Tunze NanoStream 6025's, 2x smaller power heads, 1x Quiet One 4,000 return pump, a 3"sand bed in most areas, about 70 lbs. LR, 5x Nassarius Snails, 1x Super Tongan Nassarius Snail, 1 Turbo snails, 1x Large Cleaner Shrimp, 1 Green Mandarin (eats all foods offered and has substantial Copepod population) , 1 Hoeven's Wrasse, 2x Ocellaris clowns, 4x Bartlett's Anthias, 1 Royal Gramma, 1 Kole Tang, 1x Feather Duster, 1x Caulastrea Furcata (Candy Cane), 1x Tubastrea (SunCoral), 2xTubiporidae (Pipe Organ), 2x Briarium (GreenStarPolyp), 2x Zoanthid colony, 1x (Literally) Yuma Ricordea mushroom, 1x Actinodiscus Mushroom, 5xBlastomussa Wellsi(Blasto), 2x Echinophyllia Aspera(chalice) and finally 1x Acanthastrea or the Acan frags. Most everything is frag size maybe slightly larger. In regards to the phosphate levels, obviously my personal test kits were showing 0 on everything. I had a local aquarium member test my water. So if my phosphates are through the roof then I am assuming my others like nitrates, nitrites, and ammonia are too. I just received a phosphate reactor tonight and am setting it up. I also ordered a digital phosphate reader. I also, do 10 gallon water changes weekly. I am also more careful as to how I feed the tank, not putting excess food in such. So I feel comfortable about getting all this in check. Like I said, tonight starting with the phosphate reactor that will be set up tonight. Despite my phosphate readings, I haven't lost any fish, thankfully. I am worried about my Kole tang. We have had this Kole tang for about 7 months now. Eats everything and keeps the rocks in the tank very clean. Yesterday was water change day (Sunday) and the Kole tang seemed slightly bothered by it this time. He/she was fading its color and hiding. Nothing too drastic though! I put in a Nori sheet and the Kole tang started grazing on it. Well, today is a different story. The tang is withdrawn today, has a swollen abdomen, possibly elevated breathing, and is not interested at all in food (not normal at all for our tang). I haven't noticed the fish go #2 either. And this tang is always going! And it is never white and stringy (I read on here that could indicate bacterial infection). Here is what we feed - Spectrum pellets, Nori sheets, Mysis, Cyclop-eeze (small amounts, a little goes a long way) and Selcon is used a couple times a week. I understand poor water quality can take its toll. But if the tang was fine and then just today (Monday) not fine, could it be something else? He/she is keeping its color normal 95% of the time today also. Looking through all the posts, I did see that fish can become constipated. Could this be our situation? Firstly, great site, advice and friendly staff! I've lost count of all the number times I've referred to your site. My question is: I purchased a Kole Tang about a month ago for my FOWLR set up. Was eating fine and looking great at the store and did the same when I took him home. I had an ich infestation at one stage, but I seemed to clear that up. It's been a year and no sign of parasites. Until a couple of days ago, when I noticed the Kole scratching. Mind you, he hasn't scratched in over a month. He has a healthy appetite, greedily eating everything I throw in there, and his colours are vibrant. He seems very, very happy. All water parameters are good. I did add recommended dosage of Seachem calcium powder to the sump just before he began scratching. Could this be a cause of irritation? He hasn't scratched since as it only lasted about a day. Thanks in advance. Oh, let me add that this is a 75 gallon tank, has been running for about 2 years. I have been battling a hair algae problem. Water parameters all test within the norms. Please let me know if I need to provide more info. 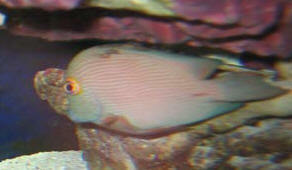 I came home yesterday to find my Kole tang swimming sadly in a cave and his skin is all splotchy (see image). As far as I can tell it is not a growth on the skin, but the pigment has become mottled. I managed to remove it from the tank without having to chase it too much and put it in a hospital tank. After a bit in the tank, hiding behind a rock I put in there, it seemed to regain a bit of strength and color. I put in a bit of Nori in case it got peckish. This morning it was still alive but I think only barely. it's color looked to be all gone and it was having trouble staying upright. I searched WWM and found only one reference that looked like it might fit, stress. the only thing that didn't quite match was that the reference article said that their fish still had strength and energy. I had this fish for a week. During that week it looked healthy, was nibbling at the rocks and had found a friend. My fairy wrasse, following it around like a puppy. It showed no signs of illness. I hope you can help, if it's not too late. 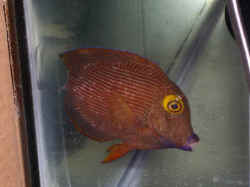 Have read as many articles as possible om <on> the Kole Tang and still a bit concerned, I purchased a small Kole Tang 2 weeks ago, picked one that was eating, fins erect, good colour etc., mouth looked OK, no damage, but lips looked to protrude like Kissing Gourami, thought this was OK as per photo's. or the small piece of rock, is it natural for these fish ? <Yes, and a good sign the fish is interested in food. Should be no worries here but a pic would have been nice to confirm your concern. <Mmm, mouth does appear to be open more than the norm. damage from shipping/handing. As long as it is eating good and has a full girth, no caved in stomach, I would just continue observing. I will ask Bob here for his input. Thank you for your input/help. Mine was based on his statements, and is why I suggested photos. <You're very welcome Chris. Will relay your thanks to Bob also. About 4 weeks ago, I purchased a Kole tang from my LFS. He was active, constantly foraging, and quick to respond to anybody watching the tank. For the past 4 weeks, he's been living in a 75 gallon tank all by himself. varia). And, of course, the usual army of copepods, amphipods and Asterinas. Because I perform a small water change daily, the parameters tend to remain very stable. Temperature wavers between 78 and 80 degrees (depends on the time of day), specific gravity 1.023-1.024, ammonia & Nitrite both at 0 ppm, nitrates stay around 2.5 ppm, and ph at 8.4.
even as recently as last night, when I was watching the tank before I went to bed. Today, while performing my water tests, I didn't see him come to the surface, which was odd. I found him hiding behind a rock. He was pointed more vertically than horizontally, he was breathing very rapidly, and had some patches of lighter coloration near one side of his lower rear side. When he didn't respond to food being dropped into the tank, I got worried. under the mouth has what might be a slight swelling, but I'm not sure if I'm seeing a real problem, or if my brain's exaggerating what I'm seeing because I'm looking for something to be wrong. Unfortunately, I can't get a good photo shot to get a second opinion. Any idea on what may have caused the illness and, more importantly, what I can do to treat him? <I'd just "wait and see" at this point... perhaps this is some sort of residual (hopefully transient) "capture/handling/shipping syndrome" (very common with wild-caught fishes...)... and will solve itself in short order (also the usual nature of these affairs). - Kole Tang Changing Colors - Hi there how are you? <I am well, thanks for asking.> I have a question or two for you. I purchased a Kole tang about a week ago at a local pet shop it looked healthy it was continually eating algae off the live rock in the tank and with further inspection I took him home. After a day or so it started to eat I tried a variety of foods including dried see weed, brine shrimp, blood worms and a frozen seaweed variety angel formula. 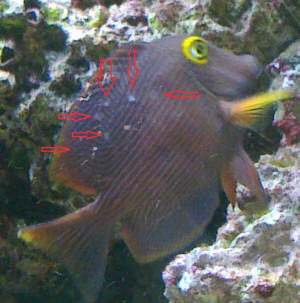 <As an FYI - Angel Formula is actually a sponge based food for larger angels... not so much sea weed in there.> After about four days I noticed some blotches on his sides I have had many battles with marine ich before and I know this isn't it. <Could be for a variety of reasons, but I suspect your problems with Ich would be due to the fact that you didn't quarantine your fish before placing them in the system. Please read up on this here: http://www.wetwebmedia.com/quaranti.htm > These blemishes seem to be below the surface mostly seen under bright light, these blotches have spread to the head area as well they don't fall off and they don't look fuzzy like fungus. <These fish can change their colors depending on mood, time of day, etc... most likely it is under stress from the move to your system and is just feeling out of sorts. It will take a couple of weeks to a month for this fish to feel at home.> The tang is still very active but is a finicky eater it seems to be feeding off the rock and some areas of the glass where algae has started to form. I am wondering if It is Stress that is causing this any suggestions. 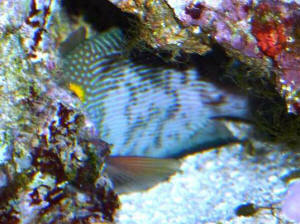 <Yes... stress - give it time, be patient.> He is housed in a 72 gallon tank with a Lemonpeel angel, a blue devil damsel, two common clowns about an inch long, a purple Pseudochromis small as well, and a very small tomato clown. It seemed to quarrel with the blue devil damsel for a while but now it seems ok. All other fish in the tank are feeding and have a clean bill of health. If you have any suggestions please E mail me back. Thank you Stan N.